The simplest tools in a lab or facility are often some of the most essential. It’s difficult to imagine how a researcher could do their job without critical items like sample cups and graduated cylinders. We recognized the value of these daily use materials and we are committed to providing high quality items, competitive prices, and great customer service along with a wide selection of useful products. From Reagent Containers to Specimen Collection Cups, having the right sample cup available for each task is a basic lab requirement. Our inventory of sample cups meets standard lab supply requirements. All sample cups are made from durable, multi-purpose polystyrene. These essential sample cups come in secure, bulk packing for easy ordering and organizing. Products include clear and opaque screwcap storage containers that are available with either standard caps or caps with cross cuts, multi-purpose sample cups, specimen collection cups, translucent screwcap extra-large capacity containers, and urine collection containers with patient ID labels. We also carry Tite-Rite™ containers for leak proof storage and transportation, even in hospital pneumatic tube systems. Order branded sample cups for use with specific analyzers including Abbott AxSYM Sample Cups (for use with Abbott AxSYM, and Architect analyzers), HORIBA ABX: Reagent Containers (used for both Cobas Mira and Horiba ABX analyzers, available in 4mL, 10mL, 15mL, and 35mL sizes), and Sample Cups for Roche Cobas Mira (used for Cobas Mira®, Bio®, Fara®, and Horiba ABX® analyzers, and available in multiple colors with an attached snap cap). The Formalin Filled Tite-Rite™ Containers are packaged in convenient carry packs and have the new “click” close design for 20mL, 40mL, and 60mL sizes. Nesting sample cups save time and improve accuracy by eliminating the task of re-labeling smaller samples. They simply sit inside an already-labeled collection tube for secure storage and transportation. At its simplest function, a graduated cylinder is used to measure the volume of a liquid accurately. Used extensively in a variety of laboratory and research settings where most chemicals are in liquid solutions, graduated cylinders are indispensable. Our inventory of graduated cylinders satisfies all standard research and laboratory needs. The heavy-duty plastic is long-lasting, safe, and well-designed for accurate measurements with a non-wetting interior surface that eliminates concave menisci. All our cylinders are made from either translucent polypropylene (PP) or crystal clear polymethylpentene (PMP). Both products ensure longevity and promote safety as the cylinders are far less likely to suffer damage and breakage. The PP cylinders are able to withstand a continuous working environment of up to 100°C and PMP cylinders can withstand a continuous working environment of up to 170°C. The PMP cylinders are also known as TPX®, which is a registered trademark of Mitsui Chemicals. 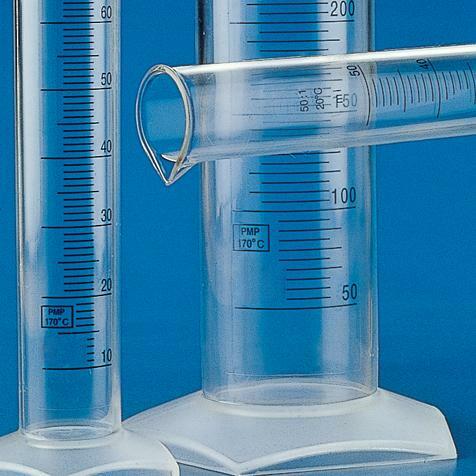 Every size and type of graduated cylinder available on our site has a wide opening to accommodate easier filling, and a tapered pour spout for convenience and accuracy. The pentagon shaped bases are wide, stable, and roll resistant. The high quality plastic is suitable for a liquids and conforms to ISO 6706-1981 (E) and BS 5404 Part 2 (International standards for plastic cylinders). Both the molded graduation and printed graduation cylinders meet Class B Tolerance standards, which indicates the tolerance of the graduation marks. Our PMP cylinders with printed graduations are available in bulk or individually in sizes ranging from 10mL to 1000mL. The PMP cylinders with molded graduations are also available in singles or multiples in sizes from 10mL to 2000mL. All of our PP graduated cylinders have molded graduations and are available in both single and multiple packages with sizes ranging from 10mL to 2000mL.